The Pasteur carried thousands of Allied troops during that war, and also served as a prisoner of war transport. She also carried thousands of French troops during the Indo-China War, earning her Nation’s highest honor. The Pasteur was sold to the nation that she formerly carried troops to fight against, and finally became the luxury liner that she was designed to be. 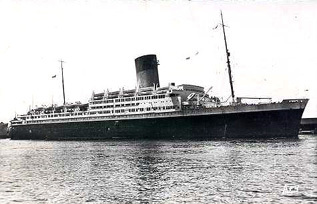 She went on to serve as a cruise ship, almost became a floating hotel, and ended her history as a barracks ship. The Pasteur finally sank at sea- too proud to go the the breakers. Source: Hal Stoen, The long voyage of the ship Pasteur.